What have I experienced in photographing this mostly nocturnal bird? 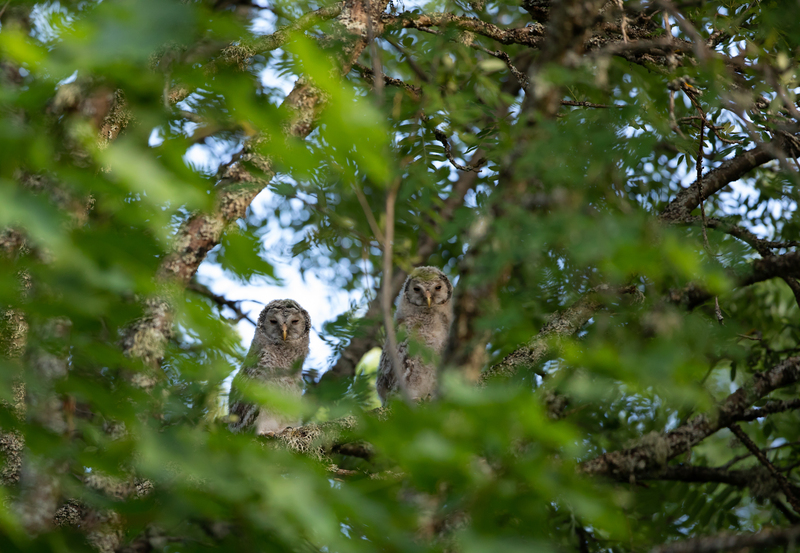 Ural Owls need old trees to nest, but they also use other birds’ old nests. They like large forest massifs. 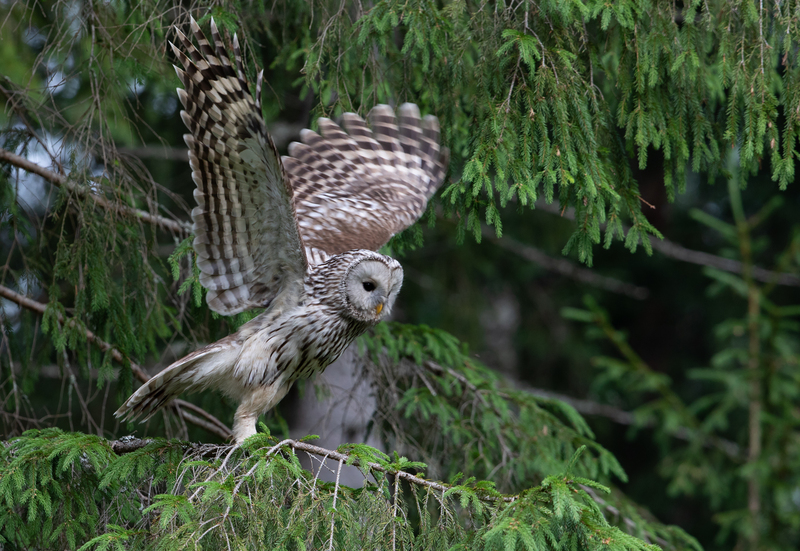 Ural Owls in Estonian forests prefer locations with grass fields or open spaces like clear cut forest areas. 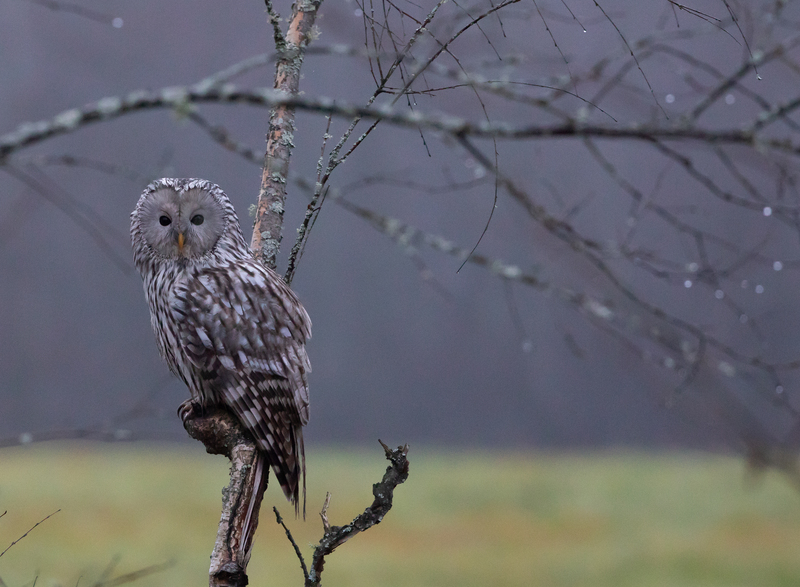 Mice are the main food of Ural Owls in Estonian forests. According to many sources the female Ural Owls are very aggressive during nesting if you go near their nest. I have never experienced it, even when I have been two meters from the nest. 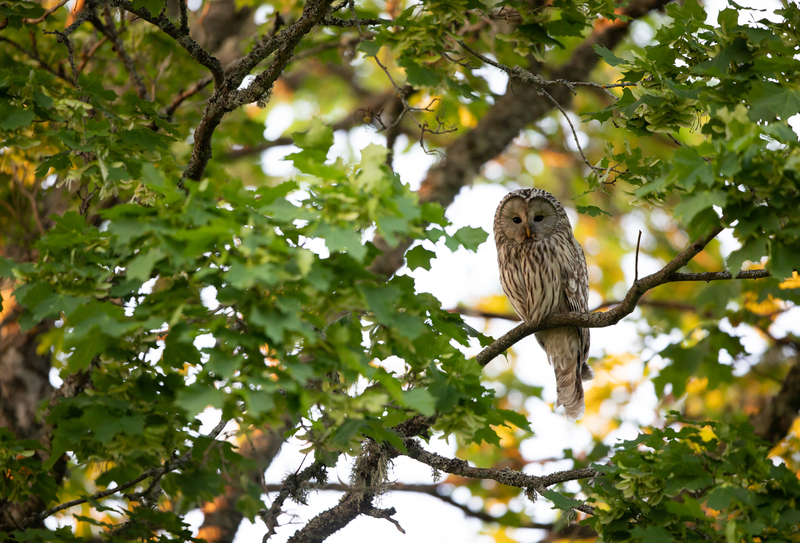 It also happened this year when I accidently found a female Ural Owl sitting in a tree. 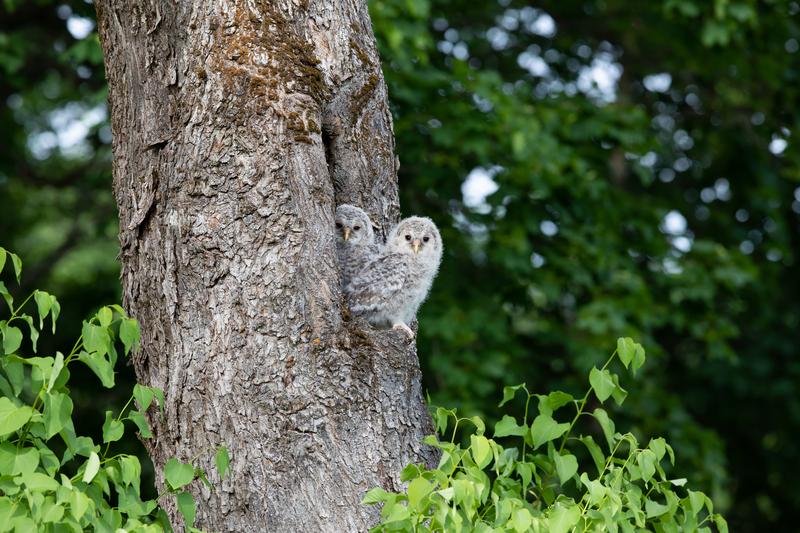 The next day I came back, erected my photography tent near the area and found that owlets came out from the nest, which was right there where I had stood the day before by accident, only two meters away. Maybe it depends on your purpose upon approaching the nest. Owls usually “attack” when ornithologists are very near the nest and take chicks out of for their job or something like that. 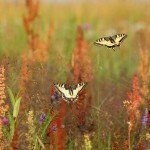 When I approach with peaceful intentions I am absolutely sure animals feel that. They sense whether there is a threat or not. Many cultures have traditions related with owls, some say they are mystical birds. I understand that, especially having spent time with Ural Owls. Even if you are absolutely quiet or hidden, they can still notice or see you. They appear out of nowhere and arrive in absolute silence, although they are quite big birds. 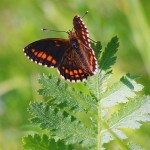 By the way, males are smaller than females and during nesting males are a little bit scared to approach the females. The female owls’ voice, on the other hand , is very defensive and reminds me of a dog barking with a sore throat, especially during nesting. There is another aspect worth pondering and I believe there are similar examples with other birds and animals. Everything in their life is set. Before the female lays eggs, she gets the male to bring her food. After a while she decides how many eggs she should lay that year. She has an inner “mechanism” that tells her how many chicks they can manage and feed. In Estonia it’s usually two owlets but they can lay more eggs. 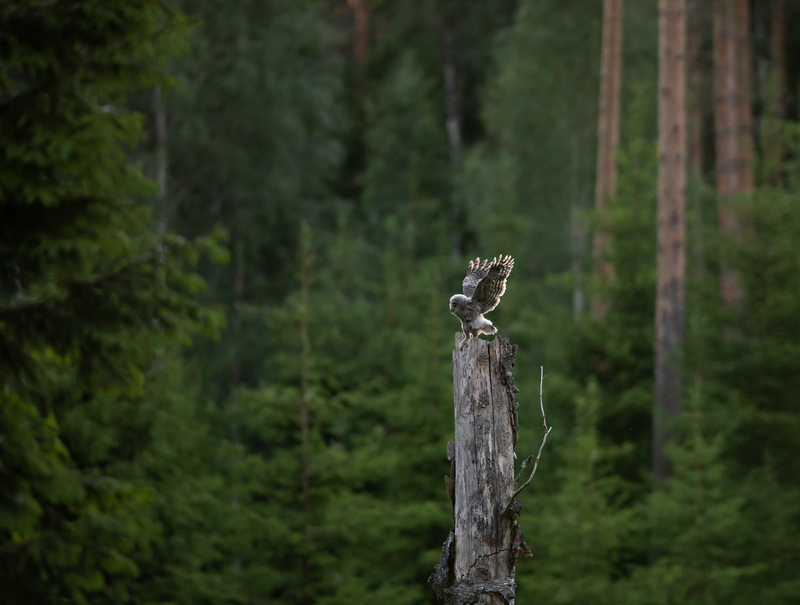 When I photographed Ural Owls in Estonian forests this year, I had opportunity to see how a male was teaching his youngster to prepare for flying. That was very special. They sat on the same tree branch—the father was near the trunk and the youngster was on the thinner part of the branch. When the male shifted outward, the youngster had to do same, and they repeated this 4–5 times. At the end of the branch the youngster had to start making flying motions and it seemed to me that the purpose of the exercise was to teach the owlet how to fly or encourage it. Want to join ? 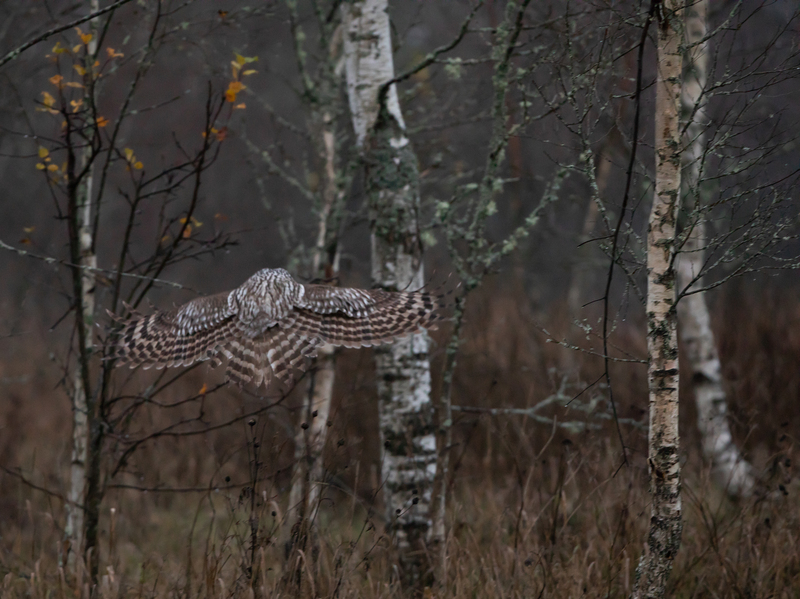 Ural Owls in Estonian forests. 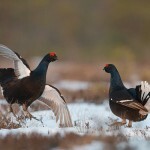 This entry was posted in BIRDWATCHING, CUSTOM WILDERNESS TOURS, PHOTO SAFARI and tagged bird photography, birdwatching, nature tours in Estonia. Bookmark the permalink.